Among the new series joining The CW's Fall 2013 line-up is Reign, a period drama about Mary Stuart, the woman who would eventually go on to be known as Mary, Queen of Scots. The clip above gives us a look at the re-introduction of a young queen and her betrothed, Francis, a prince who may not be quite ready to settle down and get married. But the two seem to have some chemistry the moment they set eyes on one another. Others don't seem nearly as keen on this relationship, however. 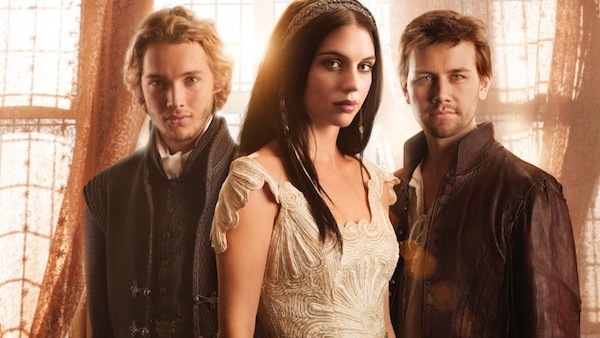 Reign comes from Stephanie SenGupta, Laurie McCarthy, Frank Siracusa and Brad Silberling, and stars Adelaide Kane as Mary, with Toby Regbo playing Prince Francis. Here's the CW's full description for the series. Hidden between the lines of the history books is the story of Mary Stuart, the young woman the world would come to know as Mary, Queen of Scots. Queen of Scotland since she was six days old, the teenage Mary is already a headstrong monarch - beautiful, passionate, and poised at the very beginning of her tumultuous rise to power. Arriving in France with four close friends as her ladies-in-waiting, Mary has been sent to secure Scotland’s strategic alliance by formalizing her arranged engagement to the French king’s dashing son, Prince Francis. But the match isn’t signed and sealed, it depends more on politics, religion and secret agendas than affairs of the heart. Prince Francis is intrigued by the fiery Scot, but like most young men, he resists the idea of settling down into marriage, especially when he has a history with a lady of the court and his own point of view on the wisdom of an alliance with Scotland. Still, an attraction between Mary and Francis is ignited. Further complicating things is Bash, Francis’ roguish half-brother, who has a history of his own - despite his illegitimate birth, Bash is his father’s favorite. And now that Bash has caught Mary’s eye, a royal triangle may be forming. While at French Court, fierce foes and dark forces conspire to sabotage Mary’s marriage to Francis and even threaten her life, until a mysterious shrouded guide becomes her ally. With danger and sexual intrigue around every dark castle corner, Mary rallies her ladies-in-waiting and steels herself, ready to rule the new land and balance the demands of her country and her heart. The CW has Reign set to air on Thursday nights after The Vampire Diaries. Check out the CW's full fall schedule here.